Royal Enfield has is now offering rear disc brake for the Classic 350 Redditch edition motorcycles. This feature was earlier only available in the Gunmetal Grey variant. The Classic 350 is the company’s most popular model. This year, alone Royal Enfeild has managed to sell 50,000 units of this model every month . Redditch edition now comes with a 240mm single-pot calliper rear disc brake. Which is similar to the one used in the Classic 350 Gunmetal Grey and the Classic 500 models. There is no other change in the bike, It is powered by the good old 349cc air-cooled single-cylinder carbureted engine. This engine puts out 19.8bhp and 28Nm of peak torque and it mated to a five-speed transmission. The Redditch edition is available in three catchy colours – red, green and blue. With the introduction of the rear disc brake, the Redditch edition motorcycle will now cost 8000 rupees more than the standard Classic 350 at Rs 1.47 lakhs (ex-showroom). There is no sign of ABS being offered in any of the Royal Enfield models, however dealers claim that it should be available by next year. The 500cc models already gets dual-channel ABS in global markets . 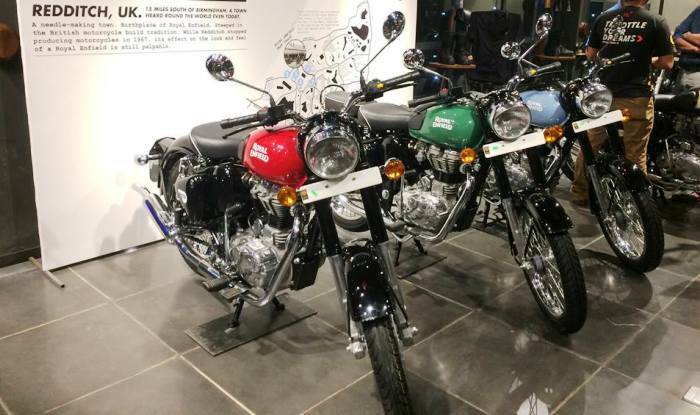 Most likely Royal Enfield will start to offer ABS to all its model in India with the launch of its much awaited twin cylinder bikes .